A powder-coated chrome fence stretcher with turquoise roses. 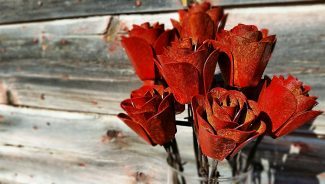 A dozen antique rusted red roses. 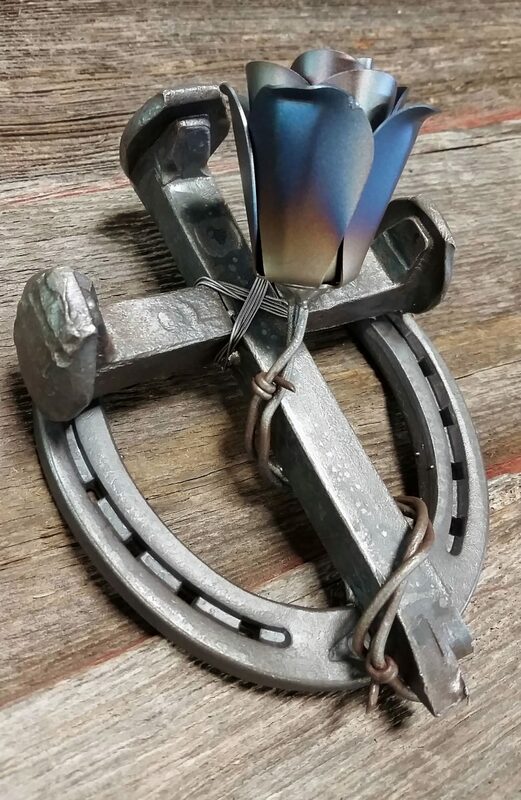 Barber used a horseshoe, railroad spikes and a metal rose for this design. A railroad spike crucifix with metal roses. 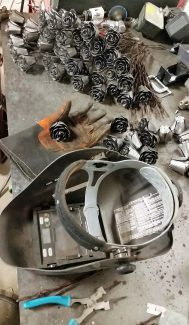 Barber welds the metal roses to the barbed wire stems. Three years ago, while Shawn Barber wandered through the Black Hills Stock Show in Rapid City, S.D., he never imagined he would see an idea that could turn into such a lucrative part-time career. "I happened to stop by a booth that was selling rustic western furniture," he said. "Laying on one of their coffee tables was a crude rose made out of some scrap metal. It was made from rusty metal and faded John Deere paint. What really caught my eye was the rusted barbed wire they used for the stem. I went on to the next booth, but the wheels were turning inside my head. When I got home, I started doing some research on making rose buds until I came up with my own design. The next time I went to town, I came home with some sheet metal and a pair of tin snips," he said. His vision came to life. One rose turned into three, which turned into half a dozen. 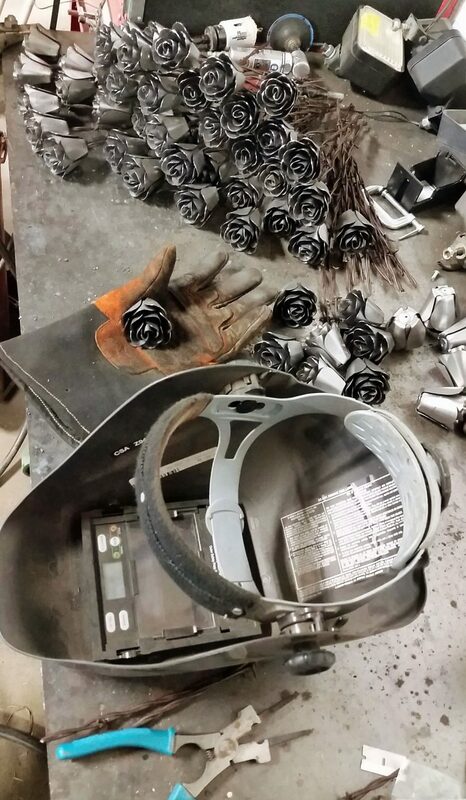 He welded the stems of these roses together and turned it into an arrangement that was placed into a vase and given to a special girlfriend for Valentine's Day. "It turned out so nice, that I made three more for my close friends to give to their girlfriends for Valentine's Day," he said. "I also made one for my grandma. She loved it." "After that, people would see them and just love them," he said. "It became a calling for me, and has turned into a nice part-time, seasonal business. My busiest times of year are Valentine's Day, Mother's Day, Christmas and Memorial Day. But I also get orders for weddings, birthdays and anniversaries." Barber said he has crafted over 2,000 roses since he made the first one three years ago. "There are three different occasions where they were used for marriage proposals, and two of my family members are buried with two different roses 6 feet underground. They truly do last forever," he says. He has shipped roses to the lower 48 states and Canada. "People are really starting to like them for weddings because I can do specific shades and colors," he aid. "They also make great anniversary gifts." The rose design was created from a four-petal simple cutout that takes four cutouts to make one rose head. Barber has hired out the cutouts to a company who can laser-cut the petals out of a full sheet of sheet metal and ship it to him. From there, he hand mints the roses using two pairs of needle nose pliers to bend up each pedal one layer at a time. "I can have one rose head up in about 2 minutes or less," he said. He then cuts a 9- to 10-inch piece of barbed wire, which is welded to the rose bud and masked off to paint. The barbed wire serves as the stem, and gives the rose a rustic look. Barber then sandblasts the rose head, and paints it. He offers a variety of finishes from rusted to painted, as well as powder-coated and numerous hydro-dipped patterns. Barber graduated from New Underwood (S.D.) High School in 2006. He attended a two-year vo-tech school in Rapid City, S.D., where he studied to become a collision repair technician. After graduating in 2008, he chose to move back to the family farm. Today, he is the fifth generation to farm and ranch with his family. They have a 350 head cow/calf operation, and 5,000 acres of pasture and farmland in western South Dakota. Barber grew up around auto painting, since his father also had a background in that profession. "I pay a lot of attention to paint materials and finishes on my roses," he said. "I think the quality paint job I put on the roses and the finishes I use is what sells my product." Barber has marketed the roses mostly through social media sites like Facebook, Instagram, and a website. "Business has spread mostly through word of mouth," he said. "It is a powerful tool." Although Barber currently offers personalized service to his customers, he hasn't ruled out creating an online store in the future. "I do everything the old-fashioned way," he said. "All of my sale orders are custom-built to order. It usually takes me one to two weeks, depending upon the quantity I have to make. I really enjoy offering customers the personalized touch. I want to make sure they get the color and shade they want so they are really happy with it," he said. Making the roses has come with a few unique and memorable experiences. "Last summer, an old high school classmate made a request for a set of five roses to honor the five fallen police officers of the Dallas Police Department," he said. "Those roses were done in a blue and black fade paint job, and each rose featured a silver vinyl decal of each of the officers badge numbers. These roses were given to the Dallas Police Department by my classmate and I." His first order for roses for a marriage proposal came from Canada. "They ordered a dozen purple roses with one hand-engraved with the words 'Will you marry me?'" said. Although Barber is happy making roses, he is looking to expand his business into other unique items. 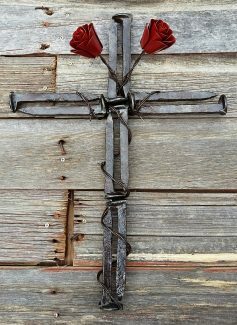 After finding a supplier for old railroad spikes, Barber started making different sizes and variations of crucifixes with roses and barbed wire on them. "People have really been receptive to them," he said.